Raúl loves snow, which is a white and delicious thing we could make into lemon sherbets and ice creams if we could always eat them up. Unfortunately, Raúl has never seen real snow, although he would like to, especially at this time of the year when it falls in Europe and some parts of Spain. In winter people wear coats because it´s really, really cold, more than in Lima anyway, which is a grey and sad city, especially since Raúl´s mother went to Spain to work and send money to him and his father, who worked in construction, although recently he stays at home, lying in bed, looking at the ceiling and not constructing anything. Raúl also works. He sells chewing gum and cigarettes on the microbuses, which are like buses but smaller, and although sometimes the drivers get upset because they say it annoys the passengers, he always manages to get on and sell something, never much, but enough to be able to eat a sandwich and a juice. Sometimes he´s lucky and can buy himself something for his llama to eat, because in Peru there are lots of llamas, which is a bit of a strange animal, between a horse and a camel. As everyone knows, the Peruvians are descendants of the Incas, a great people conquered by the Spanish a long time ago. A long time before Franco died, who was a man who inaugurated reservoirs all day. Raúl doesn´t work that much because he goes to school in the mornings, and then he has to do his homework, just as he promised his mother the day she left for Spain and asked him to please study hard and not become a sponger like his father. When Raúl´s father heard this, he was extremely pissed off, but it was already time for the aeroplane to take off and everyone hugged each other and cried a little, mainly his mother. So on the days Raúl doesn´t want to study or prefers to stay outside selling cigarettes and chewing gum, he suddenly remembers his mother and wants to punish himself for being a sponger, and he goes home to do his homework. Raúl writes in some old notebooks that the teacher has given him. His teacher also wants to go to Spain, and Raúl feels something similar to pain when she talks about the country, because it always seems that she is about to go, as many people really do nowadays. Raúl misses his mother above all at this time, when Christmas is coming and he walks through the centre of Lima, which is the capital of Peru, pressing his face against the brilliant shop windows, where there’s an enormous amount of toys that he’ll never be able to buy. Now he doesn’t even dare to insinuate this to his father, because he’s always pissed off, and takes his llama and -wow! – he goes to look for work in construction and returns at night angrier than ever because they have no money. Raúl´s father also gets a little sad at Christmas, and sits at the table for hours, not saying a thing, staring at the calendar because he knows that at the end of the month, the money his mother is sending them from Spain will arrive. With that money they can live, although it´s never much, of course. Raúl´s mother always writes to him, and last Christmas she also sent him a present, a Ronaldo shirt. Raúl really likes getting letters from his mother. He likes smelling them a little before he opens them and reads them many times, lying in his bed, until he almost learns them off by heart. In her letters, Raúl´s mother always tells him about things in Spain, where she works as a cleaning lady, in someone´s house. The husband is a lawyer and the wife is a teacher. At the start, Raúl´s mother cried a lot because she missed her son, and also her husband, although he´s a bit of a sponger. Now she doesn´t cry as much any more because three years have gone by, and although she always thinks about those two, about how much she wants to see them, she knows that it’s the best thing for everyone. At least this way Raúl is able to eat, and buy himself shoes, and feed his llama. Raúl´s mother is saving money to be able to pay for Raúl and his father´s aeroplane tickets. Then everyone will be together, especially now that Christmas is coming. They live apart, and this is totally unfare. Paco looks out of the window and sighs. The snow is falling thick and fast and Curro and Manolo will probably be playing happily, while he has to finish the homework they asked him for in class and he still hasn’t finished, because he was thinking about Christmas. Christmas is an especially happy time in Spain. The streets are decked with an infinity of lights and wreaths, people walk about hurriedly making their purchases, and they all receive presents, since as well as the traditional Three Kings, lately they also have Father Christmas, so Christmas is flooded with gifts: toy cars, soldiers, Nintendos, computers. And there are always sweets and food. Here nobody starves to death and everyone has coats for the cold, and in summer they go to the beach in their own cars. There they play, drink wine and eat paella, which is a special yellow rice. Also they like ham, and potato tortillas, very tasty traditional meals. In Spain everyone has work and they live happily in their own homes, and it doesn’t matter if it’s cold or if a tremendous rain falls, because they always have heating and hot food. Spain isn´t as big as Peru, but it has a big population and that’s why they could conquer the whole of America, except the United States, which is bigger and people speak English, which is why you can’t understand them. The thing is that in Spain, Christmas is the best thing in the world, and Paco, after writing his essay about this momentous holiday, will go out to play in the park. As he lives in Madrid, he most likes to play at snow fights with his friends, and then go away skiing or skating. He also goes out to play catch, then he comes back home and eats cakes and pies all the time. Paco’s dad is a bull-fighter and his mum is Andalusian. As they have lots of money they can give each other all the presents in the world when Christmas arrives, and they also go away travelling whenever they feel they’d like to. Paco likes to go to his grandparents’ town. They are retired and have the national health service for their infirmities, and when his mum and dad can’t take him, he takes the Metro and in ten minutes he’s in Barcelona, in Real Valladolid or in Sporting de Gijón, that are other cities in Spain, very clean and well taken care of and each one has its own football team, although Paco supports Real Madrid, where Ronaldo, Raúl, and Sidane play, who are players that Alianza Lima or Universitario de Deportes would have right now. Paco also likes bulls a lot, like all the Spanish, and when he grows up he wants to be a bull-fighter, just like his father. Or a footballer, although in Spain there are more bull-fighters than footballers, and that´s why the good footballers are taken away to South America. This Christmas Paco is going to ask his mum and dad for a bull-fighter costume, and he´s going to go and practice in the bull-fighting field that is very close to the park where he plays football with his friends. But Paco´s mum and dad´ll give him a load of other presents and then they´ll travel all over Spain having amazing fun and they´ll have a really good time. As Paco´s parents are very good, they will definitely also take the Peruvian lady who does the clining with them, food and everything they need. They´ve had this lady at home for three years and they say that they´re lucky and she also says that she´s lucky because she could have had different people, who do not pay well and exploit immigrants and sometimes they even kill them. But they´re not like that. They know that this lady is Peruvian and that she has a son the same age as Paco, a son she misses a lot, above all now that Christmas is coming, which is a date when the family should be together. To them, that this lady could live so far away from her loved ones is completely unfare. Translation of “Distant.” Copyright Jorge Eduardo Benavides. By arrangement with the author. Translation copyright 2013 by Anna Heath. All rights reserved. 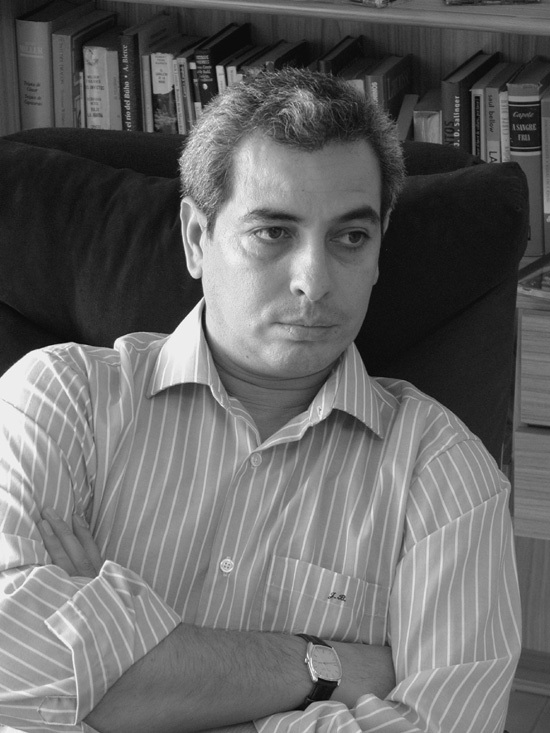 Jorge Eduardo Benavides (1964) Studied law and political science at the Universidad Garcilaso de la Vega. From 1991 to 2002, he lived in Tenerife; there, he was a regular contributor to the cultural supplement Diario de Avisos and the editorial director of Siglo XXI. In Tenerife he also founded and directed the literary workshop Entrelíneas, after having taught creative writing at the Casa de la Cultura de Santa Cruz and the Universidad de la Laguna. He has published two books of short stories, Cuentario y otros relatos (Okura 1989) and La noche de Morgana (Alfaguara, 2005), as well as the novels Los años inútiles (Alfaguara, Madrid, 2002), El año que rompí contigo (Alfaguara 2003) and Un Asunto Sentimental (Alfaguara, 2012).He was shortlisted for the prestigious Rómulo Gallegos Prize 2003 and won the Julio Ramón Ribeyro nouvelle Prize 2009.